"This makes a sandwich similar to one I used to get at a local restaurant when I lived in a suburb of Chicago. My all time favorite! Serve on crusty rolls with roasted sweet or hot peppers, if desired." Combine water with salt, ground black pepper, oregano, basil, onion salt, parsley, garlic powder, bay leaf, and salad dressing mix in a saucepan. Stir well, and bring to a boil. Place roast in slow cooker, and pour salad dressing mixture over the meat. Cover, and cook on Low for 10 to 12 hours, or on High for 4 to 5 hours. When done, remove bay leaf, and shred meat with a fork. 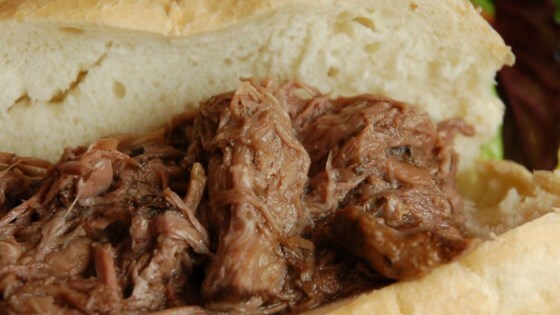 Make this great Italian beef for sandwiches in your slow cooker.